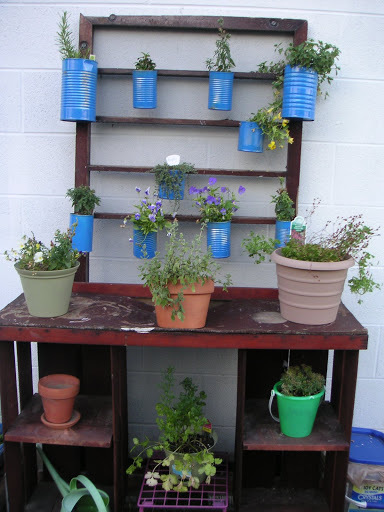 The blue tins contain pansies, thyme, oregano, rosemary, spearmint, and a couple others that have since lost their ID tags. They’re nailed to an old screen door we found in the basement. The shelves below were made out of Sunkist Orange crates and also a basement find. More pansies, unknown flowers, cilantro, and somethin’ else. Our rain bucket with glitter decals. You’d be surprised how quickly the rain fills it up. Keep forgetting to put a screen over the opening to fend off mosquitos. 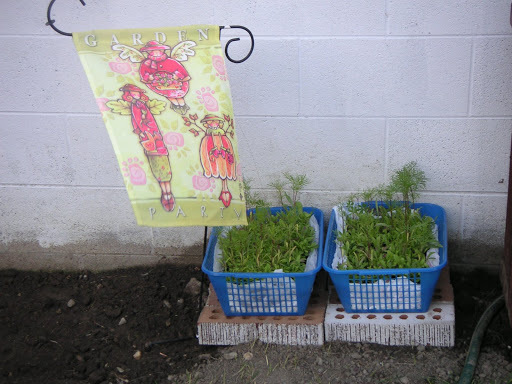 The two blue baskets contain a wildflower seed mix; the lining is plastic. Would have used the grocery paper bags I saved, but Christi put them in the recycling while I wasn’t looking. The flag just says “Garden Party” and has freaky fairies on it (a Home Depot purchase). This is the rest of the garden minus the blue tins and shelved plants. The space was previously all grass and is between the back of our two-car garage and the alley-bordered fence. On the other side of the fence is the secret garden our neighbor, Anna, plants. She’s a whiz with that green thumb. Anyway, in the back are mostly sunflowers and wildflowers. Veggies flank the brick path most of the way up. This would be Summer’s doing…the gnome. I have more gnome pics coming. This is the back of the garden by our neighbor’s fence. 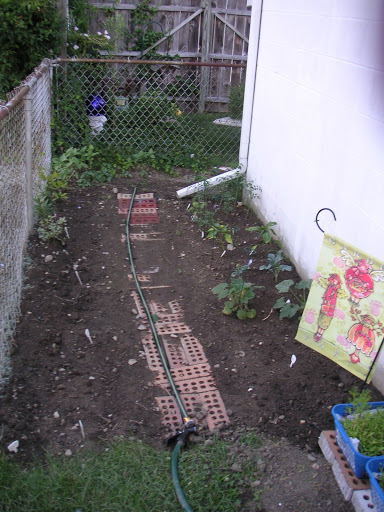 The bare spot is the beginning of a watermelon plant and to the left are the sunflowers. I’m pleased. I would never have thought you’d take an interest in gardening. Always felt like I was *making* you do it. 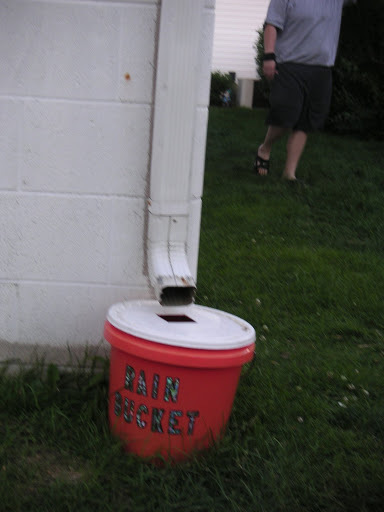 a tip if you’re interested….a capfull of Clorox added to the rain bucket will kill any mosquito larve and will prohibit skeeters from laying eggs. 24 hrs of *air time* evaporates the chemical and makes it safe to re-use on plants. The garden is looking great. Can’t wait to see future progress, and I can almost taste that first fried zucchini. 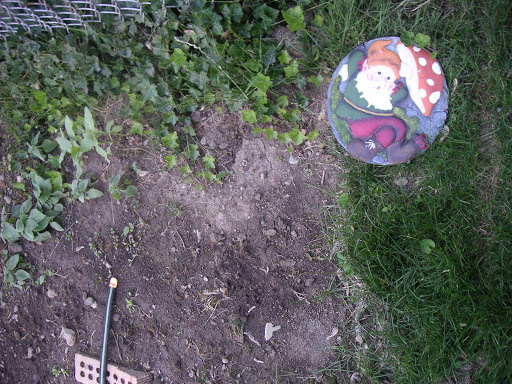 Love, mom…p.s…i think it needs a few more gnomes and fairies to protect it.